Homens lisboetas estão entre os TOP 5 dos homens mais bonitos do mundo. Ranking feito pela revista Travelers Digest. mundo, bem-educados e cheios de orgulho do seu pequeno pais, mas com paisagens esplendidas. Em Lisboa, os senhores, carismáticos e atléticos podem surpreender com o seu conhecimento de não só da sua cultura, mas de outras nações. A tradição ainda é mantida em grande consideração. Um lisboeta pode sempre surpreender levando alguém a um dos muitos bares do bairro alto para ouvir umas melodias de Fado. According to the Traveler’s Digest newly published list, Portuguese men rank 4th among the top 10 world’s sexiest and best looking after Stockholm (Sweden), New York City ( United States), and Amsterdam (Netherlands). Portuguese men tend to be worldly, well-educated and brimming with pride for their small but scenic country. In Lisbon, the often tall, charismatic and athletic gentlemen might surprise you with their firm grasp of not only their own culture but that of the other nations as well. All this said, tradition is still held in high regard for these divine manifestations of old-world values. They would surely appreciate an impromptu Fado performance at one of the many bars in the Barrio Alto, or a nostalgic stroll in the Alfama District – one of the most delightfully preserved sections of the city. Whatever you decide to do, these Latin seducers are guaranteed to sweep you off your feet. 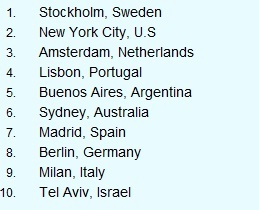 Other selected capitals and respective males of the species include, Sydney (Australia), Madrid (Spain), Berlin (Germany), Milan (Italy) and Tel Aviv (Israel). TD Magazine didn’t offer specifics about the methdology used and how they got to the results. Travelers Digest is an online travel directory and magazine with content provided from an array of professional travel writers stationed around the world.